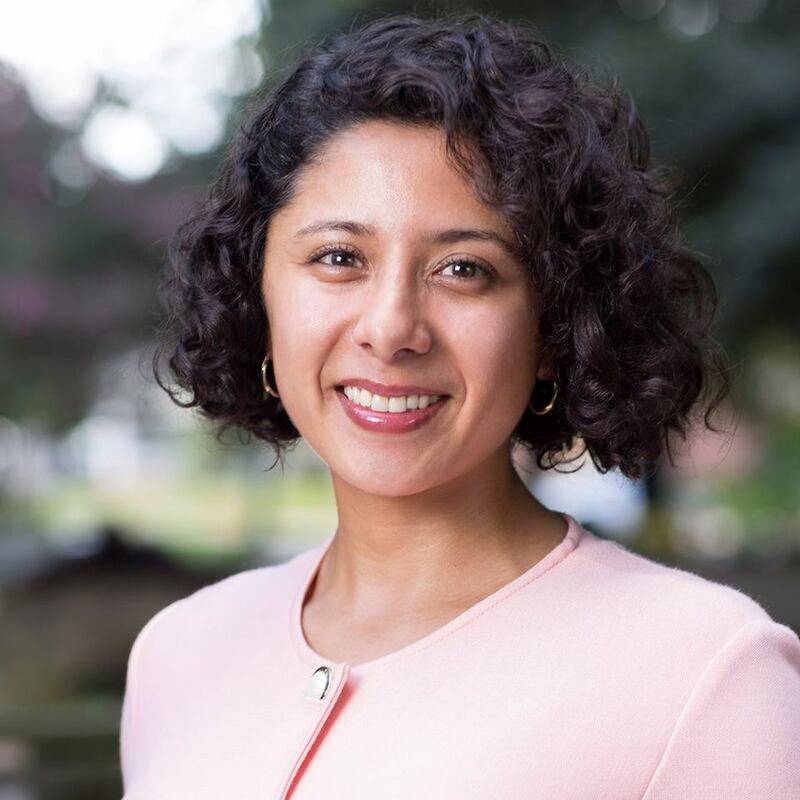 If you weren’t paying attention to County Judge-elect Lina Hidalgo before, you are now. Precinct 1 Commissioner Rodney Ellis, the lone Democrat currently on the court, said Hidalgo is a quick study who will settle into the role quickly. “She’s smart and was very bold to make the decision to run, and to make a commitment to public service,” Ellis said. Hidalgo said her immediate focus is recruiting a top-flight staff and pledged to announce a transition plan in coming weeks. Depending on how many Emmett holdovers Hidalgo retains, she could have as many as 30 positions to fill. [Robert] Eckels, who served as county judge from 1995 to 2007, urged Hidalgo to focus on building relationships with the four county commissioners. Unlike the mayor of Houston, who has significantly more power — and far more leverage over — city council, the county judge can accomplish little without the support of commissioners. Eckels said the mild-mannered Emmett was successful because he was able to manage the sometimes outsized personalities of commissioners. Hidalgo said she would welcome Emmett’s advice during the transition. She said a top priority is to make county government more transparent, and suggested holding regular town halls. She also is eager to settle the federal lawsuit brought by poor criminal defendants brought two years ago, in which they argue Harris County’s cash bail system is unconstitutional. She emphasized the importance of flood control, and said she has yet to determine whether to make changes to the projects list for the $2.5 billion flood protection bond voters approved in August. With the election of Adrian Garcia in the Precinct 2 commissioner’s race, Democrats will have a 3-2 majority on Commissioners Court, starting in January. The Republican commissioners, Steve Radack and Jack Cagle, said they looked forward to working with Hidalgo. Radack, who has served under three county executives since he first was elected in 1988, said he expects court members to continue to work well together with Democrats in charge. Cagle said he would not be bothered if Hidalgo used her new pulpit to speak out on statewide and national issues like immigration and criminal justice, so long as the county continues to serve its largely nonpartisan functions, like maintaining infrastructure and providing health services. “When you fix a pothole, there’s no R or D that goes on it,” Cagle said. Houston Mayor Sylvester Turner said Wednesday morning he was surprised Hidalgo won. He praised Emmett, with whom he worked closely during storm events including Hurricane Harvey and the Tax Day Flood, as a treasured partner. Indeed. The power on Commissioners Court lies mostly with the Commissioners themselves – they have the bigger budgets, after all. The Court has always operated in a collegial environment and with consensus among the commissioners. We’ll see how that changes now that Dems have the majority. For now, the priority for Hidalgo is going to be getting to know her future colleagues and everyone else who will need to get to know her. The Press devotes a cover story to the proposed Houston-Dallas high speed rail line. Most of what’s there will be familiar to anyone who has been following this along with me, but this bit from the story caught my eye. Financing will be complex. Tim Keith, a North Texas native with a quarter century’s experience in finance, was named Texas Central’s CEO in July. Keith says about a third of the project, around $4 billion, will be funded by institutional investors — pension funds, insurance companies and the like looking for projects likely to yield reliable dividends for years. “There’s a very large appetite by institutional investors for U.S. infrastructure investment,” Keith says. Various high-speed-rail experts have speculated that Texas Central will rely on real estate development around its stations for revenue. Art Guzzetti, vice president for policy at the American Public Transportation Association, says that JR Central gets more than a third of its revenue from station-related development, including the 774-room Marriott in Nagoya, Japan. Baruch Feigenbaum, a Reason Foundation analyst who supports Texas Central despite his skepticism concerning most U.S. high-speed rail projects, expects the company to charge between $50 and $60 per ticket. However, Feigenbaum’s calculations are based on the assumption that the company will own and develop the land around its stations. Otherwise, fares will have to be set significantly higher. Such speculation intensified when Jack Matthews, a powerhouse Dallas developer, was appointed to Texas Central’s board. Matthews has holdings in the Cedars neighborhood south of downtown Dallas, where Texas Central plans to build its Dallas station. But Texas Central officials insist that their business model relies almost entirely on fares, not on making money off things like parking and concessions. The company expects to pull in some profit from station-related development, but that’s not what it’s focused on when selling the concept to potential investors. The real estate stuff is interesting, but I don’t know how much to make of it. In theory, at least to begin, there will only be two stations, one at each end, so the amount of investment available may be limited. To some extent, this is related to the opposition to the rail line – the rural counties that the line may pass through don’t see any benefit to them because there won’t be any stations outside of Houston and Dallas, at least not in the foreseeable future. If there were talk of stops between Houston and Dallas, perhaps some of the opposition would be geared towards lobbying for a station instead. Just a thought. It’s the ticket price speculation that I want to talk about. I recently had to drive to Dallas for a memorial service. For a variety of reasons, I went up and came back on the same day. Had there been the option to take a train, I’d have gladly done so, because driving for eight hours even in benign traffic conditions is hell, and I’d have had more time to spend with the people I went to see if I could have ridden the rail. More to the point, gas was $2.49 a gallon at the Madisonville Buc-ee’s, where I stopped each way. If you assume this is about a 500 mile round trip – from where I enter I-45 to where it becomes US 75 is about 235 miles – then the average traveler probably uses at least 20 gallons of gas, which at that price is $50. In other words, for what I spent on gas, I could have bought a ticket for a trip that would take less than half the time (even factoring in the trips to and from the train station) and would have been free to read, surf, nap or whatever while in transit. That sure sounds appealing to me. Now, how many people need to make this kind of trip on a given day is an open question, and the economics changes when you have more than one people involved – if I’d brought Tiffany and the kids with me to Dallas, I’d have spent the same amount on gas, but four times as much on train tickets. The calculations get way too complex for me very quickly. I do believe this is a good idea, I know for a fact it will never get any easier to build something like this, and while I have sympathy for the rural folks who won’t see the benefit of the line, it has always been the case that large infrastructure projects create some amount of hardship for some number of people. Ask the former residents of the Fourth Ward about the effect I-45 had on their neighborhood, for example. We should do what we can do mitigate the effects of these hardships, but their existence should not be a reason to not do this. We have a single preferred route for the Houston to Dallas high speed rail line. 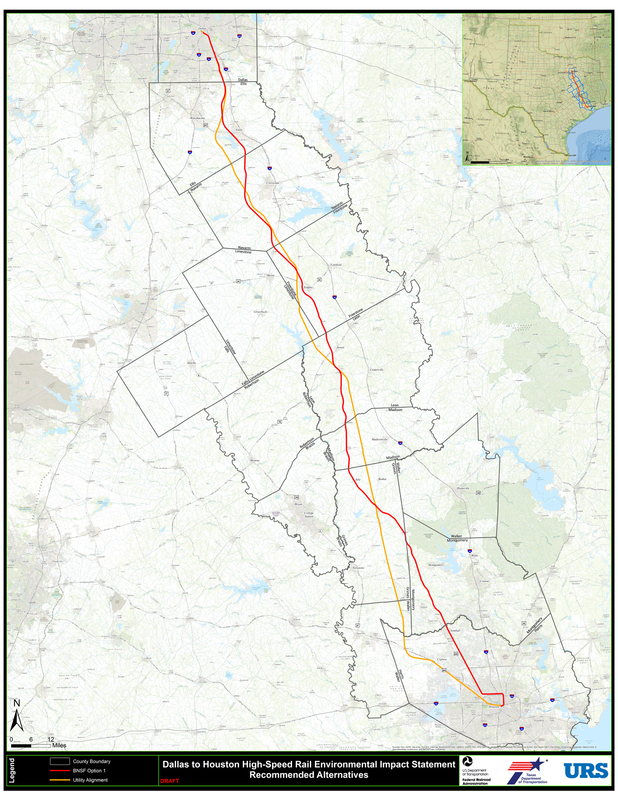 Texas Central High-Speed Railway (TCR) today informed the Federal Railroad Administration (FRA) that it recommends narrowing the consideration of potential high-speed rail corridors between Houston and Dallas to a single preferred corridor known generally as the Utility Corridor. TCR has concluded the Utility Corridor is best suited to satisfy the goals of the project to provide reliable, safe and economically viable high-speed rail service between Dallas and Houston using the N700-I Bullet System technology. TCR has spent several years identifying potential corridors for high-speed rail service between Dallas and Houston. To that end, TCR expended significant effort looking for solutions to engineering, construction and economic challenges associated with building high-speed rail in or along the existing Freight Corridor, and believes the Utility Corridor to be the superior alternative. Additionally, as TCR examines the various alternative alignments, one of the company’s goals is to reduce the project’s impact on communities and landowners to the extent practicable by using existing rights of way. TCR will recommend inclusion of an alternative involving the I-10 corridor as a potential approach to downtown Houston and looks forward to working with the City of Houston to evaluate this option. TCR will now focus on potential alternatives keyed to the Utility Corridor that meet the business, environmental and connectivity priorities of the project and will submit additional information to the FRA for further detailed analysis during subsequent phases of the environmental review process. As the Dallas Transportation Blog notes, that’s the orange line on the embedded map. The TCR announcement page also has some quotes from Houston-area elected officials, including Mayor Parker, lauding the inclusion of a possible I-10 corridor approach to downtown. That may make some critics here a bit happier, as they had been agitating for TCR to not run through Inner Loop neighborhoods – see this press release I got from the Oak Forest Homeowners Association the other day for an example – though it won’t do anything to deter the more organized opponents; see this post on the No Texas Central Facebook page to see an example of that. If nothing else, this would seem to ensure that there’s no Woodlands station in the cards, not that this was likely once Montgomery County got on board with the opposition. Whether this blunts the resistance or fires it up more remains to be seen. The Chron fills in some details. The preferred route would use land along the BNSF right of way parallel to Hempstead Highway, turning near Loop 610 and U.S. 290. From there, Texas Central is changing its focus to an alignment through commercial areas around U.S. 290 and Loop 610. Elevated tracks would run along Interstate 10 to access downtown, said Robert Eckels, a former Harris County judge and president of Texas Central. “That would take us out of the residential areas, so we are going to seriously look at that as an option,” Eckels said. Originally, the proposal followed Union Pacific tracks along Washington into downtown Houston. Eckels said officials are working on all of the concerns, hoping to avoid as many as possible. A draft environmental analysis, expected to be distributed publicly later this year, will have much more detail on the exact route. Eckels said many changes remain likely. “Not everyone is going to be happy, but we can address many of the concerns,” he said. Texas Central remains focused on bringing the trains downtown, if possible, and not stopping short of the central business district, Eckels said. For a better view of what this might look like for the Houston area, see Swamplot, which zooms in on the map and highlights the possible station locations. I’ll be very interested to see what that draft environmental analysis looks like. I’m not exactly sure what an I-10 corridor would look like in this context, as there doesn’t appear to be an obvious place for the right of way that would be needed. As there are likely to be more changes coming, so are there more questions to be answered. The Trib has more. Building that high speed rail line from Dallas to Houston is one thing. Bringing it to a centrally-located terminal is another. Plans for a high-speed rail line between Houston and Dallas are moving relatively quickly beyond a recent initial round of public meetings. Questions about the route are dominating discussions. Though still years away – a 2021 launch is predicted under the best of circumstances — backers of the privately funded train are making the rounds to drum up support. Thursday, they met with the Houston City Council’s transportation and infrastructure committee. Based on preliminary maps, one of the two likely routes for the train within the Sam Houston Tollway has residents on edge. The option follows property near an electrical transmission line, then parallels U.S. 290 before hugging the Union Pacific Railroad line along Washington Avenue. What has residents, and by extension their council members, worried is what the elevated tracks — one for each direction of travel — would do to nearby properties. Residents are concerned about whether buildings will be bulldozed to make way for the train. “I do not see how that is accommodated in the existing right of way,” said Tom Dornbusch, president of the Super Neighborhood 22 Council. Dornbusch and others have grave concerns about what the train would do to the Washington Avenue corridor, which has seen rapid residential and commercial growth over the past decade. Northwest of Washington Avenue, council member Brenda Stardig said, the high-speed line could have far-reaching effects on the rural landscape along U.S. 290. Former Harris County Judge Robert Eckels, president of Texas Central High-Speed Railway, said backers are conscious of the worries. Previous high-speed rail plans have been doomed by opposition, something Eckels said the current team is trying to avoid. Eckels stopped short of making any assurances, saying the company would have to balance many factors in finding the best route. He acknowledged that any route within Loop 610 would prove complicated and costly. See here and here for the background. No question that downtown is the right place for the Houston terminal, but getting the train those last few miles into downtown is no easy task. We’ve discussed this in the context of commuter rail, and the issues here are the same but bigger since the trains in question would (presumably still) be moving a lot faster. That existing track along Washington Avenue crosses major thoroughfares such as Shepherd and Heights at grade, which would have to remediated given the obvious safety risk. I don’t know what the best answer is, but I’m fairly certain that there is no answer that doesn’t upset someone. Part of the process of getting the Houston-to-Dallas line built. A proposed high-speed rail line between Dallas and Houston, already the subject of a federal environmental review, will soon be the focus of a series of public meetings in Texas, according to the president of the firm looking to build the line. The Texas Department of Transportation will lead the six meetings next month in Dallas, Houston and other locations in between, Robert Eckels, the head of Texas Central Railway, said Saturday at The Texas Tribune Festival. Residents in the potentially affected regions will be invited to ask questions about the proposal. The meetings will be conducted as part of the federal environmental review. Texas Central is attempting to build a multibillion-dollar direct line between Dallas and Houston that will transport travelers between Dallas and Houston in 90 minutes or less — without public subsidies. Eckels said Saturday that he expects the train to run daily every 30 minutes between 5 a.m. and 11 p.m.
“What we’re finding in most of these small towns is that they want this train to come through here,” Eckels said. “We’re not expecting” a controversy over this. I wonder if that means they expect, or at least hope, that the train will make some stops in their towns. I don’t think that’s part of the plan, but who knows what the future might hold. It may be that they see benefits to them even without a station in their vicinity. Anyway, look for an announcement soon about a public meeting near you. The Federal Railroad Administration published a document on its website Wednesday officially kicking off a highly anticipated environmental review of a proposed high speed rail line between Dallas and Houston. The document, called a Notice Of Intent To Prepare An Environmental Impact Statement (EIS), marks the start of a process that will involve public input on Texas Central High-Speed Railway’s ambitious endeavor, which aims to connect travelers between Dallas and Houston in 90 minutes or less. The company has said it plans to operate the country’s fastest and only profitable high-speed rail line without public subsidies. Company officials have been preparing for the federal review for more than a year and have quietly worked on the logistics of it with federal officials in advance, according to people involved in the discussions. The EIS, which could take more than a year, will examine possible routes for the rail line and how each scenario would impact the region’s environment, including agricultural land, streams, floodplains and wildlife, as well as various federal regulations including the National Historic Preservation Act. The review will also investigate “the potential impacts of stations, power facilities, and maintenance facilities to support HSR operations,” according to the federal notice. The doc is here. As you may recall from the light rail process here in Houston, there will be public meetings, in this case organized by TxDOT and held in the affected area, which is more or less the I-45 corridor between Houston and Dallas, to present information about the project and allow for further feedback. This process will take some time and will if all goes well lead to a Draft Environmental Impact Statement, a Final Environmental Statement, and a Record of Decision. How long that takes is at least somewhat proportional to how contentious or smooth the process is. The Chron had a preview story from the morning before the Notice of Intent was published. Initiation of the environmental process doesn’t lock public or private officials into anything, or set specific deadlines. “Timelines for these kinds of projects vary widely,” said Mike England, spokesman for the Federal Railroad Administration. Public agencies, notably the railroad administration and Texas Department of Transportation, must conduct the review – including soliciting public comment and holding meetings in areas affected by the plan. Crocker said the local rail district currently has a study examining how to bring passenger trains into downtown Houston. “We’ve kind of kept the high-speed rail line in mind when we’re doing that,” Crocker said. See here for my previous blogging on this, plus PDiddie and Texas Leftist for reports on a recent meeting some of us bloggers had with the TCR folks. The optimistic time frame for the start of construction is 2016. TCR will undoubtedly have a few wish list items for the Legislature next year as well, mostly to smooth out the state regulatory process, but nothing that is likely to be a big deal. I’ll keep my eyes open for announcement about the public meetings and will let you know when I know more about them. Dallas Transportation has more. The mayors of Houston, Dallas and Fort Worth announced Thursday their unified support for the construction of a privately funded bullet train between the two metropolitan regions. “If successful, Houstonians will have a reliable, private alternative that will help alleviate traffic congestion and drastically reduce travel times,” Houston Mayor Annise Parker said at a press conference at Houston City Hall. Texas Central Railway announced in 2012 its plans to build a 200 mph rail line that would transport passengers between Dallas and Houston within 90 minutes. The company has said it will not require any public subsidies to fund the multi-billion dollar project, which it is developing in partnership with a Japanese firm, Central Japan Railway. The mayors praised the project and predicted it would aid the state economically and environmentally by reducing the number of people traveling by car. “Not only will high-speed rail significantly reduce travel times and traffic congestion for Dallas and Houston area residents, but it will also create new, high-paying jobs and stimulate economic growth,” Dallas Mayor Mike Rawlings said. The endorsements come as the Federal Railroad Commission is “30 to 60 days” away from formally launching an environmental impact study of the project, said Robert Eckels, a former Harris County judge and president of Texas Central Railway. The study, which will be funded by Texas Central Railway, is a critical step on the project’s path to drawing approval from federal regulators. Mayor Parker’s press release for this is here. As you know, I’ve been following – and a fan of – this project for some time. What’s especially exciting about this is the news that Texas Central Railway will be getting the EIS process started soon, because from there is where it begins to get real. I had the opportunity along with a couple of my blogging colleagues to meet with Eckels and other TCR folks and ask them some questions about the project; PDiddie wrote up some notes from the meeting. I don’t have a whole lot to add to that except to say that you should check out TCR’s latest presentation about the state of their business, and then go look at Eckels’ presentation at a recent HGAC brown bag lunch, which is on YouTube. It’s an exciting time. Dallas Transportation and Texas Leftist have more. The federal government, Texas and a private company are collectively working on two studies to assess the impact of a high-speed rail line between Houston and Dallas, U.S. Department of Transportation Secretary Anthony Foxx confirmed Tuesday. Foxx, speaking at the Texas Transportation Forum, an annual conference put on by the Texas Department of Transportation, said the Federal Railroad Administration, TxDOT and Texas Central High-Speed Railway will move forward this year on environmental impact studies related to the project. The completion of such a study is typically a key early step in developing a major transportation project. TxDOT Executive Director Phil Wilson said two separate environmental impact studies are in development. The Federal Railroad Administration and Texas Central High-Speed Railway will conduct a study of a high-speed rail line between Dallas and Houston. TxDOT, in partnership with the FRA, will sponsor a study of a slower rail line connecting Fort Worth, Arlington and Dallas. TxDOT officials could not provide a timeline for when either study would be completed. See here, here, and here for the background. As Dallas Transportation notes, there have been other studies done in the past five years, and TxDOT is doing its own study on a Texas-Oklahoma rail corridor, which would likely be an extension of Houston to Dallas. The Texas Central High-Speed Railway folks are serious about getting their line built, hopefully by 2021. There are many hurdles to be cleared, and this is just one of them along the way. If you want to hear more about it, you can hear Robert Eckels, the President of Texas Central Railway, will be speaking at an H-GAC brown bag event on Monday, January 20. See here for the details. I’m always interested in stories about the Texas high speed rail line. While Republicans may favor the company’s free-market focus, that doesn’t mean the project won’t be completely free of public costs. During this year’s legislative sessions, some lawmakers opposed the allocation of any new transportation resources unless they were dedicated to road construction and maintenance. See here and here for some background. I think it would be a useful debate to have about operations subsidies for inter-city rail transit like this. Given the tens of billions we are told we need to spend to ensure sufficient road capacity for our growing state, it may well be the case that building and partially subsidizing the operation of a bunch of rail lines is no more expensive and more scalable. For better or worse, we’re not going to have that debate, and as a private venture like the Texas Central High-Speed Railway is likely to be the only kind of rail we get built here, I’m happy to see it make progress towards that goal. I hope the Legislature will be open to hearing what Texas Central needs, and finds a sensible way to work with them to overcome obstacles. It is possible, maybe likely, there will be some Trans-Texas Corridor-style backlash against this, but I’m reasonably optimistic there won’t be. Texas Central is an idea that originated in the private sector rather than with Rick Perry, and from what I’ve seen they’ve been engaging with locals, whereas the TTC was basically an edict from above. There is a foreign company involved so there’s always room for paranoia, but this project is much smaller in scope and shouldn’t require that much in the way of right-of-way acquisition. We’ll see if that makes a difference. By the way, speaking of foreign companies, it is my understanding that Central Japan Railway Company, referenced in this linked story is not an investor in Texas Central High-Speed Railway. The two are cooperating in this effort, but one does not have a direct financial stake in the other. Whether that will have an effect on public and/or legislative opinion of this I couldn’t say, but we should at least all be clear on the facts. I was wondering when we’d see this. Reliant Park and Harris County officials on Thursday announced the launch of a campaign to garner voter support for a plan to redevelop the Astrodome, with Harris County Judge Ed Emmett and Precinct 1 Commissioner El Franco Lee each pledging $5,000 to the effort. A referendum to fund the project will appear on the ballot this November. If approved, the county would issue up to $217 million in bonds to turn the now-vacant stadium into “The New Dome Experience,” an energy-efficient event center flanked by an “inviting” outdoor green space. Dene Hofheinz, daughter of the late Roy Hofheinz, who is credited with building the world’s first domed super stadium – dubbed “the eighth wonder of the world” when it opened in 1965 – also pledged a donation during a news conference at Reliant Center. The campaign political action committee is being co-chaired by former Harris County judges Jon Lindsay and Robert Eckels and former Hispanic Chamber of Commerce President Irma Diaz Gonzalez. Lindsay, who has been a vocal advocate for preserving the iconic structure, said the committee hopes to raise $250,000 from private individuals. Officials from Harris County, which owns the Dome and Reliant Park, and the Harris County Sports and Convention Corporation, the agency that oversees the complex and conceived the renovation plan, will drive the campaign, along with a coalition of local and national historic preservation groups keen on saving the structure. See here for the previous update. I’d say the group’s first order of business is to give themselves a name, and after that it would be nice if they’d at least put up a Facebook page. The story notes that the annual Offshore Technology Conference has committed to using the renovated Dome, so that’s one more thing for the committee to tout in its sales pitch. Also of interest is the lack of a mention of any anti-referendum group so far. The lack of any organized opposition will make the committee’s job easier. But please, name yourselves. That will make my job easier. On a tangential note, Hair Balls had two posts last week reviewing the history of stadium-building in Harris County, and Swamplot pointed to this call by The Architect’s Newspaper for some bolder thinking on how to re-do the Dome. Check ’em out. Who’s advocating for the Dome? Some old familiar names are getting back in the game. Harris County Judge Ed Emmett on Tuesday after the Commissioners Court meeting name-dropped two former county judges — Jon Lindsay and Robert Eckels — who will lead the charge on a campaign to garner support for an Astrodome renovation project. A $217 million bond referendum to turn the vacant stadium into a massive, energy-efficient convention hall and exhibition space will appear on the ballot this November. Lindsay confirmed on Wednesday that he and Eckels, who will serve as treasurer, are, indeed, planning to lead the charge. He said they have had one meeting with the Harris County Sports and Convention Corp., which conceived the renovation proposal, and are planning another for next week. He said that Edgar Colón, chairman of the sports corporation, the county agency that runs Reliant Park, likely would chair the campaign. I believe this is the earlier story to which that refers. Eckels and Lindsay, who offered some warnings about the two of them being a bit out of shape for fundraising and campaign-running, are likely as good as anyone to do this. They know the county and they ought to be credible to a large segment of the electorate. Both Judge Emmett and Commissioner El Franco Lee will be on board with them as well. Honestly, I don’t know that you could have gotten a better team, all things considered. Emmett said a number of people have talked about leading the effort, but nobody’s grabbing the ball to run with it. That suggestion leaves Emmett visibly annoyed. As before, I’ll side with Judge Emmett on this. Harris County was set to move on a privately-funded plan for the Dome in 2008, but that fell through when the economy bottomed out. Maybe the Court could have acted last year, but not much earlier than that. They also could have waited for another private investor with sufficient capital to step up, but despite the plethora of suggestions for what to do with the Dome, no one with financing in hand has come forward. I don’t know if Eckels and Lindsay can fully quiet the conspiracy-minded, but they ought to muffle them a bit. Whether the referendum passes may depend largely on the age of the voters who turn out in November. Polling conducted during the past few years for KHOU and KUHF Houston Public Radio has shown a curious generational pattern. The strongest supporters of preserving The Astrodome tend to be older voters, who are more likely to have seen games in the historic stadium. Younger voters are more likely to oppose spending bond money on saving the dome. Generally speaking, off year elections skew in the direction of older voters. I don’t know what the dividing line is in the poll cited, but I feel pretty comfortable predicting that the average voter this year is likely to be north of 50. When I said earlier that Eckels and Lindsay ought to have credibility with a chunk of the electorate, these are the people I had in mind. Who better to talk to a bunch of old voters than a couple of old politicians, right? PDiddie, John Coby, and KUHF have more. Another story on the vaunted high speed rail line for Texas. The leaders of Texas Central High-Speed Railway sound very confident for a company expecting to succeed where scores of state planners, elected officials and private interests have failed. The firm hopes to have bullet trains moving Texans at 205 miles per hour between Dallas-Fort Worth and Houston by 2020. The bit that has raised eyebrows: The company plans to do it without seeking public financing. Backing the Texas-based company is a group led by Central Japan Railway Company, which handles more than 100 million passengers each year on its bullet trains in Japan. While the project is generating enthusiasm, Eckels acknowledged he’s also heard from plenty of skeptics who predict he will eventually ask for billions of dollars in public support. But Eckels said his investors would likely walk away from a project that couldn’t stand on its own. During a presentation on the array of financial and regulatory hurdles blocking the success of high-speed rail in the country, Richard Arena with the Association for Public Transportation said Texas is a possible bright spot. Arena said the state’s strong economy and growing population make high-speed rail a more likely proposition than in other regions. But he was highly skeptical that the rail project could come together without public funding. We’ve heard about this before. I don’t care how it is ultimately funded, I want to see it happen. It just makes sense. Who knows how many more super-commuters we may have in this state if one could easily travel from Dallas to Houston in an hour and a half? I wish them the best of luck, and I hope that by the time they’re done there’s a more robust local rail network to help move the passengers to their final destinations. Burka, who remembers the last time someone tried to build a high-speed rail line in Texas, has more. The way things are going, this could get built before the final pieces of the 2012 Metro Solutions plan. If high-speed rail comes to North Texas by 2020, the bullet trains will initially rely on the area’s road system — not public transportation — to get most of the riders from the end of the line to their final destination, an official said. “We do think that for the first few years the system is in operation, the collector-distributor system will largely be highways,” said Robert Eckels, president of Texas Central Railway, which wants to build a line featuring trains running every 15 to 20 minutes from Dallas-Fort Worth to Houston. 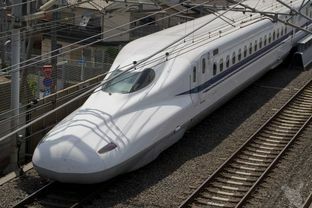 On Thursday, Eckels briefed the Regional Transportation Council about plans to bring 200-mph trains to North Texas, possibly by 2020, in a partnership with Central Japan Railway Co., which operates bullet trains connecting Tokyo, Nagoya and Osaka. The company is seeking roughly $10 billion in private investment to build the estimated 240-mile line, and it will not seek federal or state money. Eckels stressed that $10 billion is an early estimate. Depending on factors such as the location of the Dallas-Fort Worth station, the cost could be much higher, or even lower. Within the Metroplex, it’s still not clear where a station should be. Many elected officials favor putting a hub in or near Dallas/Fort Worth Airport or the CentrePort development just south of the airport. I say that having the terminals in or near the destination city centers will be a big advantage for the rail line. Even at top speed, this train will take longer to get from Dallas to Houston, but if you don’t have to spend a half hour or more at each end getting to and from the terminal as you do with the airport, that will make total travel time much more favorable for the train. I agree the transit infrastructure isn’t there yet at either end, but it will be, and when it is you don’t want to be stuck with one terminus out at D/FW Airport. Whoever it is that favors this now really needs to give that some more thought. Dallas Transportation has more. The people working on this sure do sound optimistic, even if what they’ve got is still basically vaporware. A trip from Houston to Dallas could take travelers 90 minutes if former Harris County Judge Robert Eckels, president of Lone Star High Speed Rail, is successful in connecting the state’s two largest urban regions with a high-speed rail. Eckels spoke to members of the Cy-Fair Houston Chamber of Commerce mobility committee Sept. 1 about the plausibility of constructing a high-speed rail between the two regions, which have a combined population of nearly 7 million. LSHSR is affiliated with U.S.-Japan High-Speed Rail and its partner, Central Japan Railway Company, which created the N700-I Bullet train that travels at 200 mph and will take passengers between Dallas and Houston when the rail is complete, which could be by 2020. The corridor between Houston and Dallas was selected for the first high-speed rail line because nearly 93 percent of the land in between the two cities is rural and flat, and there are few stops in between, Eckels said. LSHSR is studying several routes between Dallas and Houston for where the rail line will go, but the selection will come down to where there is right-of-way, land already granted for transportation purposes. “The goal is to be as close to the current rights-of-way as possible,” Eckels said. LSHSR is currently considering engineering, public outreach and funding factors related to the project. The rail line will be, in large part, funded by the private sector in Japan. The cost of the project is approaching $10 billion, but will ultimately reflect where the rail line ends, whether it is in downtown Houston, near the Galleria, or near Beltway 8, Eckels said. We first heard about the possibility of Japanese companies investing in a Texas high speed rail line a year ago. Eckels had previously been the Chair of the Texas High Speed Rail and Transportation Corp before moving over to LSHSR in March. I wish them all the best in getting this done. I also wish that Houston’s light rail system – you know, the 2012 Solutions plan – is fully built out by then. Check back in a decade and we’ll see. Thanks to Houston Tomorrow for the link. Nice overview of the political crime scene. Houston’s political landscape is littered with careers wrecked or damaged by allegations of wrongdoing, and for watchers of the political scene, the sight of [County Commissioner Jerry] Eversole in cuffs likely rekindled memories of fabled transgressors of yore. “Brilab,” Sharpstown, former City Councilman Ben Reyes and former County Commissioner Bob Eckels — all conjure images of the fallibility of politicians under temptation. Rice University political science chairman Mark Jones attributed some of the corruption that has tainted local politics to the “freewheeling culture” that pervades the city and state. There is such interaction between businessmen and politicians, he said, that it does not seem strange when an elected official is treated to dinner or lunch. I should note that the Bob Eckels mentioned above is not the County Judge that preceded Ed Emmett, but his father. Most of the names and cases cited in this story will be familiar to anyone who’s lived around here for awhile, but it’s a good refresher anyway. The story was of course inspired by the recent woes of Jerry Eversole, to which Rick Casey added a nicely stinging assessment of Eversole’s claim that the feds were criminalizing his friendship with Mike Surface. They’re right. Which makes me blue. My friends are nice guys and gals, mainly. But they never take me on expense-paid golfing trips to Arizona and New Mexico. Or to Las Vegas. Or South Carolina. Or San Antonio. Or Colorado, Montana, Wyoming and South Dakota. Or Reno. Nor do my friends buy me thousands of dollars worth of guns. And the last time I bought a house, not a single friend gave me a cashier’s check for $63,000 to help pay for it. What’s more, none of my friends chipped in $27,000 for the landscaping. I can’t remember the last time a friend bought me a thousand-dollar suit. It’s my fault, of course. I’m not that good a friend to them. I’m not in a position to vote for multimillion dollar contracts for them, or to appoint them to sports authority boards and such. Christof has some surprisingly good news for those who want to see commuter rail in the Houston area. There hasn’t been much public movement on commuter rail since the HGAC’s study was released a year ago. But quietly, gears are meshing, and we may have commuter rail to Galveston and Hempstead as early as 2012. On Thursday, the North Houston Association hosted a high-powered group: Harris County Judge Ed Emmett, METRO CEO Frank Wilson, Gulf Coast Freight Rail District (GCFRD) Chairman Mark Ellis, Texas High Speed Rail and Transportation Corporation (THSRTC) chairman (and former Harris County Judge) Robert Eckels, and Union Pacific’s Joe Adams. Introducing them was former Harris County Judge and State Senator Jon Lindsey, father of the Harris County Toll Road Authority. If there was ever a visual demonstration of the political will that’s aligning behind commuter rail, this was it. Color me pleasantly surprised. As Christof notes, there are still some big questions to be answered about things like who would implement and run it, how much it would cost and how it would be paid for, and where it would connect to the existing Metro system and the city’s core, but just knowing that all these players are on board and pointing in the same general direction is reason for a lot of hope. From the interviews I’ve done so far, I feel confident that Houston City Council at least would be ready to work on this. Getting it in place would greatly enhance the existing Metro system, and would give momentum for the case to expand further. Keep yout fingers crossed. Are the stars really aligning to bring a SUPERTRAIN to Texas? Maybe so! Current plans for a Texas system envision a “T-bone” track shape connecting Dallas, Austin, San Antonio, Houston and other towns. But much remains vague: where exactly the route would go, who would build it, the price and funding sources. The federal government has not yet issued guidelines for how to apply for the money, and it’s unclear if the Texas Department of Transportation — or another agency or group — would lead the project. Plans are further along in other states, including California and Florida. Nevertheless, Texas has natural advantages conducive to high-speed rail, advocates say. The terrain is relatively flat and land is cheaper than in California and Florida. “We have the ability to produce a system that is reasonably priced,” said David Dean, a former Texas secretary of state. Dean is working as a consultant for the main advocacy group, the Texas High Speed Rail and Transportation Corp.
Dean estimates the T-bone would cost $10 billion to 20 billion and could be completed by 2020. It would ease highway congestion and pollution, attract more Fortune 500 companies to the state, and help in an Olympics bid, he said. The Houston route could even help during hurricane evacuations, he added. In 1994, state plans to bring high-speed rail to Texas collapsed after a French company could not get sufficient funding for a system that would have linked Dallas, Houston and San Antonio in a triangular track pattern. The T-bone shape, requiring 440 miles of track, would be 40 percent smaller than the triangle plan. Technology has also advanced, making construction and operation easier and less expensive, Dean said. [Former Harris County Judge Robert Eckels, who is chairing the High Speed Rail and Transportation Corp,] said airlines operating in the state, which vigorously lobbied against the 1994 plan, are now open to the idea, provided the routes connect to major airports. So I wouldn’t look to buy the Texas version of a Eurorail pass just yet, but prospects are brighter than they’ve ever been. I think the prospects for the HSRT Corp will improve if the big cities on the endpoints have more robust rail systems for its passengers to connect to, including commuter lines like what’s been proposed for Houston to Galveston. Being able to leave the car at home when traveling this way will be a huge boon. I have my doubts that they can really make anything happen in the next decade, but I’ll be more than pleased to be proven wrong about that. The idea of high-speed rail is being pushed again in a big way in Texas, and backers hope to have $12 billion to $18 billion high-speed trains running by 2020. This time, they say they have taken care to ensure the idea won’t fall flat the way a bullet-train push did some 15 years ago. “In the past, high-speed rail was not completed in Texas primarily because it was a top-down model driven by lobbyists out of Austin,” former Harris County Judge Robert Eckels, chairman of the nonprofit Texas High Speed Rail and Transportation Corp., told lawmakers at a Wednesday transportation briefing. This time, he said backers from the consortium — which includes elected leaders, cities, counties and two airlines among others — reached out to past opponents to try to solve their concerns. Among them: Southwest Airlines, which fought the last high-speed rail project as a potential competitor. Southwest spokesman Chris Mainz said the airline is neutral on this proposal. The high-speed trains — with an average speed of 200 mph — would run to airports, allowing rail to work in conjunction with airlines by ferrying in passengers catching longer flights. The rail would run along the so-called “Texas T-Bone” — from Dallas-Fort Worth through Austin to San Antonio, and branching off in Temple to Houston. More than 70 percent of Texans live in the area that would be served. Lawmakers and those pushing the project said it’s crucial to come up with alternative transportation since the state population is expected to reach 40 million to 50 million by 2040. You know I love me some trains, and I’ll be happy to see this come about, if it really is possible. I don’t think I’d prioritize this kind of rail construction over commuter or light rail in urban areas, and even if I did prioritize this I’d be sure to continue pushing for urban rail transit so as to take full advantage of the network effect. But I’m still happy to see this sort of thing on the drawing board, and I hope it gains traction.